The ugly, epic-length 2016 presidential campaign has been wearying for the press, the public, and the politicians involved alike. It already seems endless, and there are nine full months left to go, enough time for a child to gestate in its mother’s womb. But, if nothing else, this deathless, ceaseless campaign has at least provided ample material for the comedians, satirists, and puppets of the world. Late Night With Conan O’Brien veteran Triumph The Insult Comic Dog, for instance, will be doing an hour-long special election special this month, a co-production of Hulu and Funny Or Die. 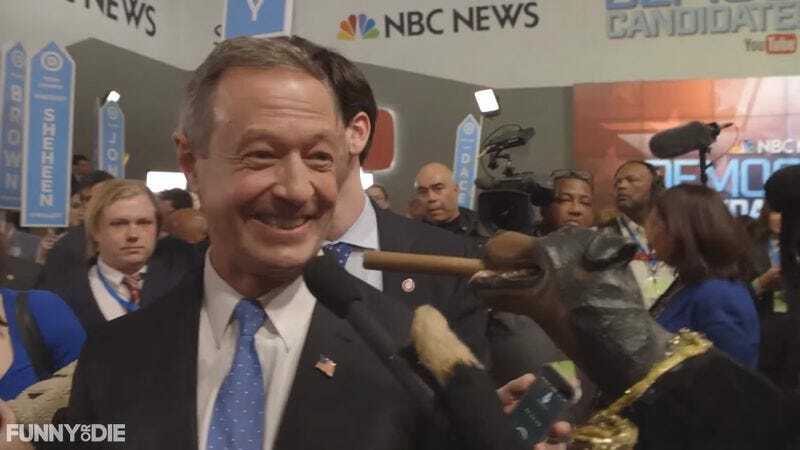 The famed foul-mouthed canine, voiced by the great Robert Smigel, has already been spotted at numerous debates and campaign stops, even having the honor of being rebuffed by GOP front runner Ted Cruz, a man normally known for his effervescent personality and boundless good humor. Now, excitingly, some footage of Triumph’s upcoming special has surfaced online. In this ten-minute clip, Triumph visits the fourth Democratic debate, which was held in mid-January in Charleston, South Carolina. The dog mainly talks to journalists, including some sad, unemployed bloggers, and a few smiling, evasive spin doctors, but he does get some face time with now-ex-candidate Martin O’Malley, DNC chair Debbie Wasserman Schultz, and even musician Killer Mike, who is on hand to support Bernie Sanders. Never one for social niceties, Triumph treats all of these people, except maybe Killer Mike, the way he treated the nerds waiting on line to see Attack Of The Clones. Later in the video, perhaps realizing that no one wants to be seen talking to a puppet, Triumph poses his rude questions via a proxy: a woman pretending to be disabled and using a wheelchair to get around. It’s a bold ploy, but it actually kind of works for a few minutes.